The weather has been weird this year. It's far below freezing in places that don't really know that kind of cold. And it's 'flip flops' weather out here in Southern California during a time when we're supposed to be donning our 'winter' sweaters and little-used jackets. 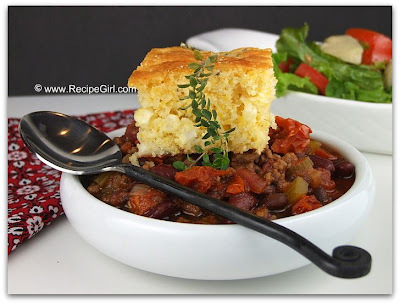 So as soon as the clouds come out, I'm excited for our 'soup and chili weather' and start scouring the cookbooks for something to try. 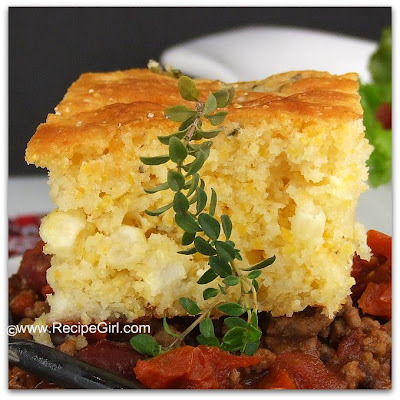 Unfortunately, the chili I tried recently wasn't anything worth talking about, but the cornbread recipe that I made to go with it was: Brown Butter Cornbread with Farmer Cheese & Thyme. The butter is browned in a cast-iron skillet, and the other ingredients are mixed together and poured on top of the browned butter. I didn't have the right size cast-iron pan, so I browned the butter in a saucepan and then poured it into a 9-inch square pan and continued the recipe from there. The batter contains whole grain cornmeal, which I love. It gives the bread a slight crunch. If you don't like that of course you can use regular ground cornmeal. Sour cream, Farmer's Cheese, and the nutty-flavored browned butter help to make this cornbread a moist creation. 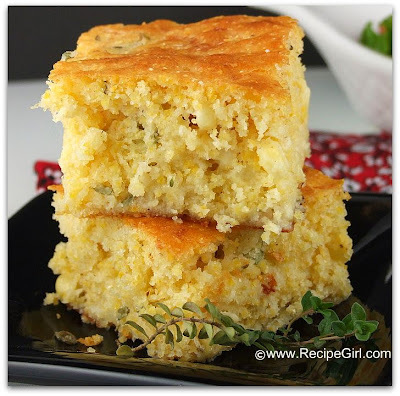 No dry cornbread here. Chunks of corn and freshly chopped thyme are mixed in there too. There are three Tablespoons of sugar in this one, so it's not terribly sweet- the savory flavors take over in a good way. Farmer's Cheese is a softer specialty cheese that you'll find in the area of your supermarket where you might see things like Gouda cheese. You can always try to sub another type of cheese but the Farmer's Cheese works very well with the fresh thyme so you might wish to give it a try. 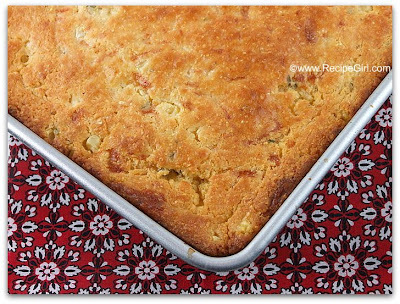 The Barefoot Contessa's cornbread used to be my all time favorite, but this cornbread was unique and tender, and it has since moved to the top of my list. It definitely enhanced the average chili that we had!